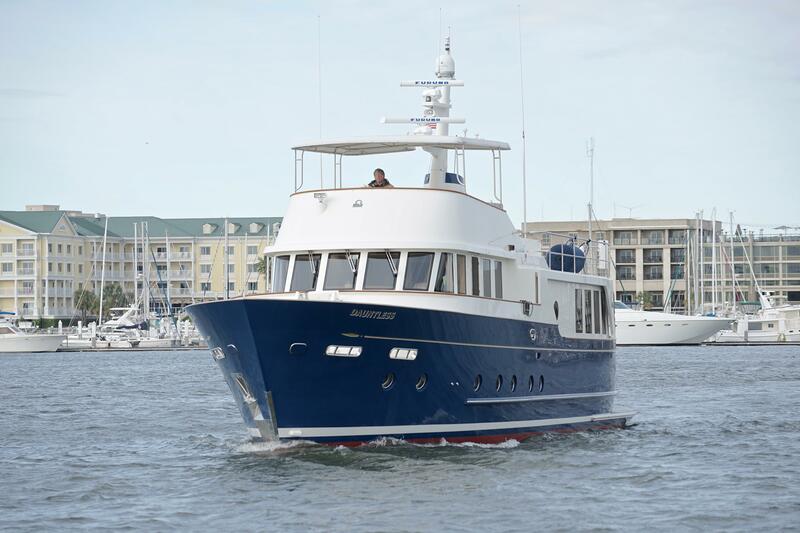 2008 Queenship Sea Spirit 60 Passagemaker "Dauntless"
This QUEENSHIP 60 PASSAGEMAKER "DAUNTLESS" is one of the finest and safest long range cruisers available today. 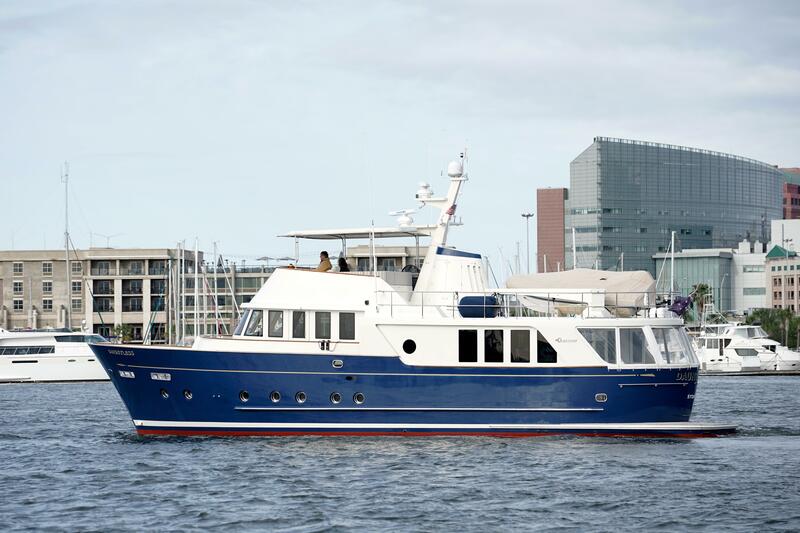 Compare to any Selene, Kadey Krogen or Nordhavn available. 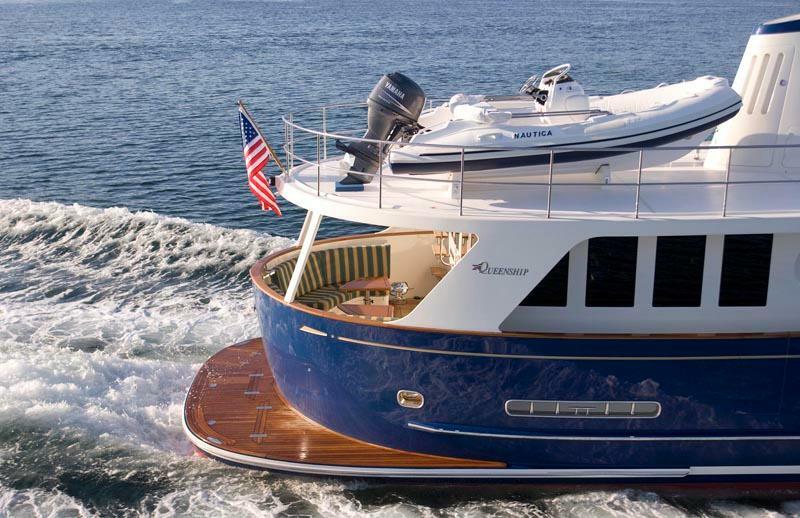 This vessel is the result of the combined efforts of Sparkman & Stephens Naval Architects and Dan Fritz, founder of QUEENSHIP. 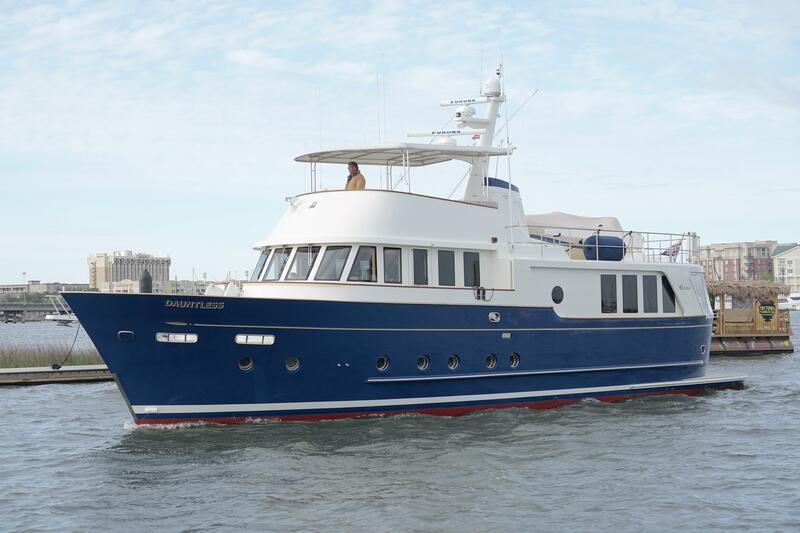 QUEENSHIP produced numerous luxury yachts from 70 to 142 feet. 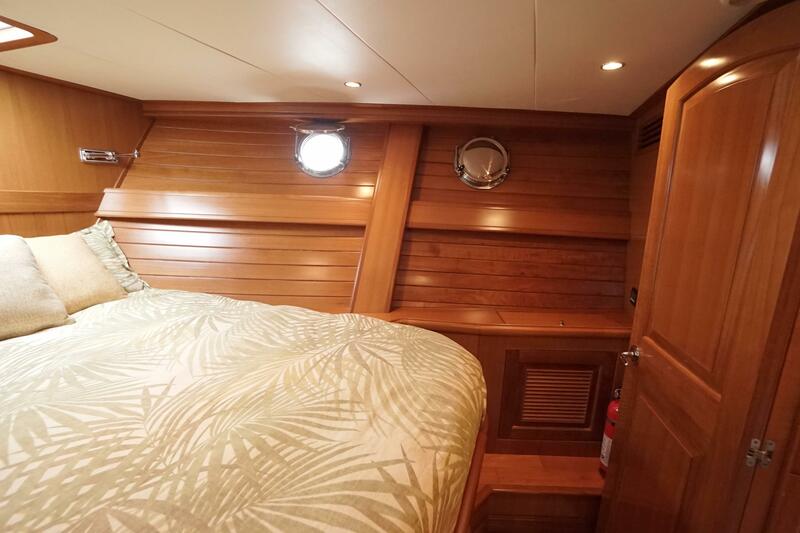 Four watertight bulkheads, a fully stabilized hull, a bulbous-bow hull form, redundant systems and Single Lugger 1276-A2 Diesel are just a few of the features that contribute to the trans-oceanic cruising range and luxurious accommodations of "DAUNTLESS". 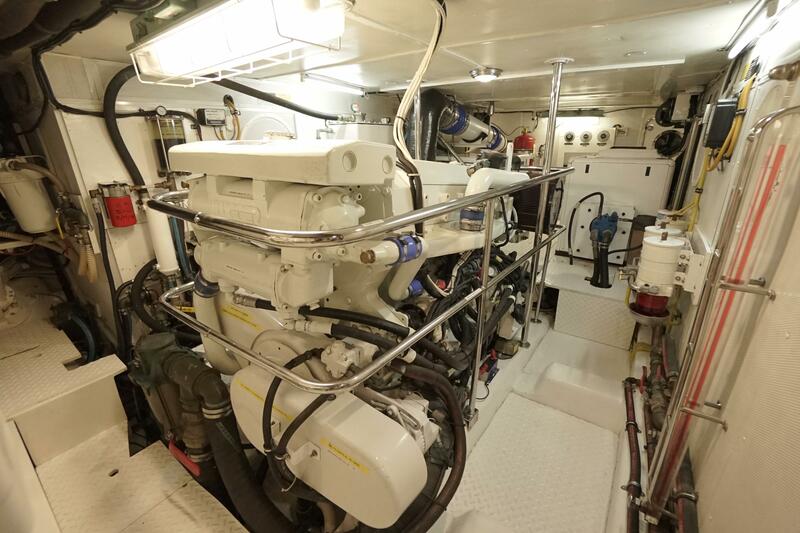 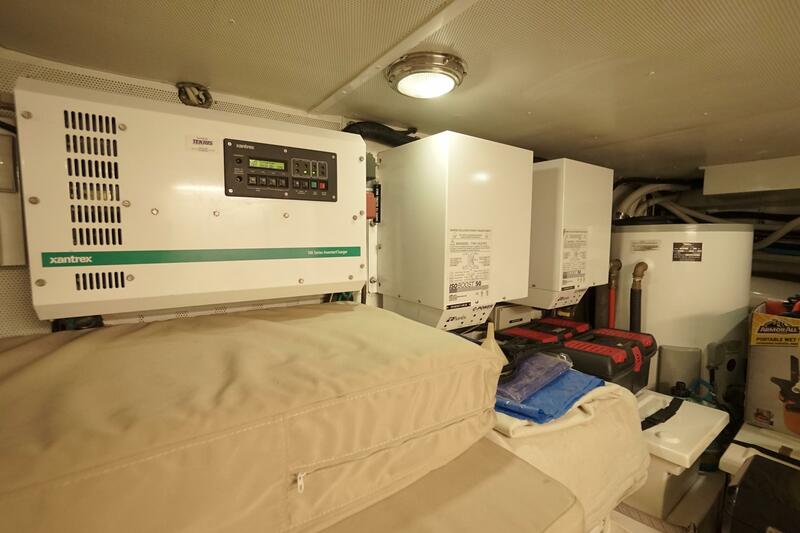 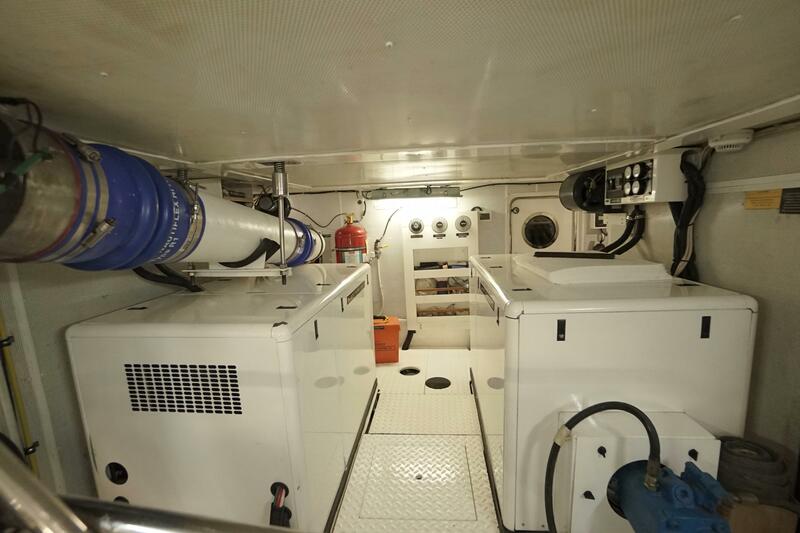 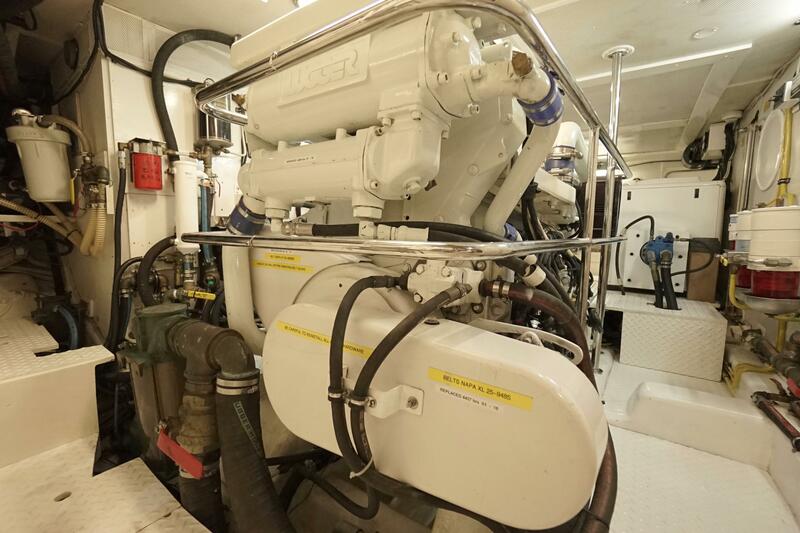 A single Lugger diesel engine is backed up by Wesmar Get Home PTO which can be run off either of the vessel's two 20kw generators (port new November 2018). 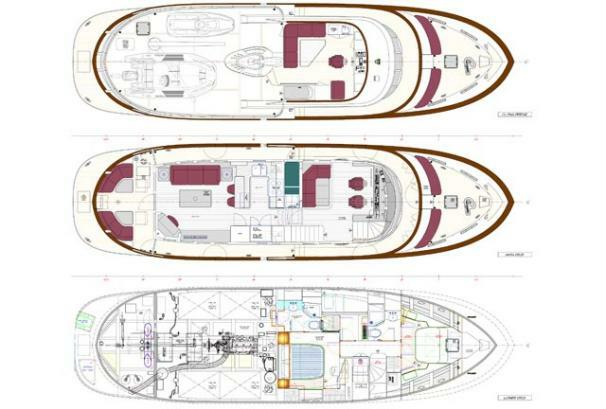 This propulsion package provides for a cruising range of approximately 3,000 nautical miles at 8.5 knots. 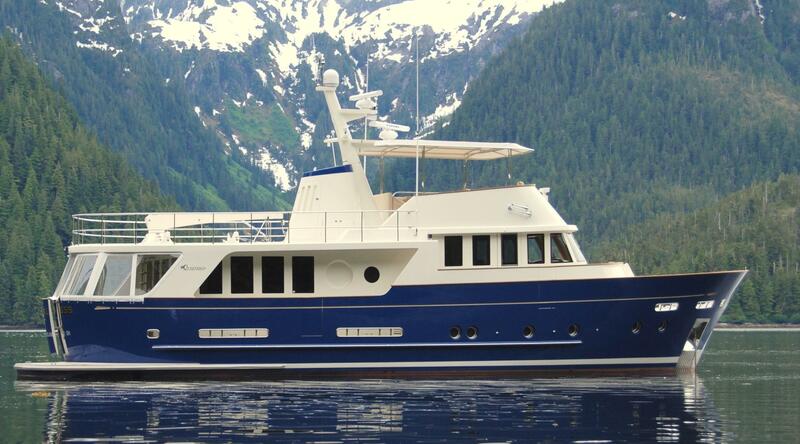 With a 6.5 knot cruise and one generator running, range can be extended to approximately 7000 nautical miles. 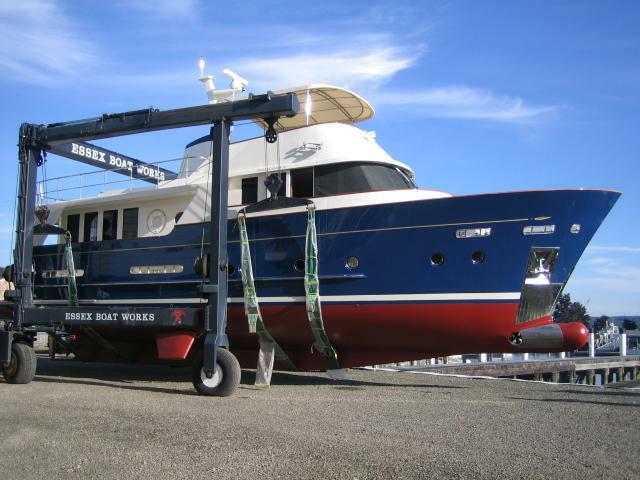 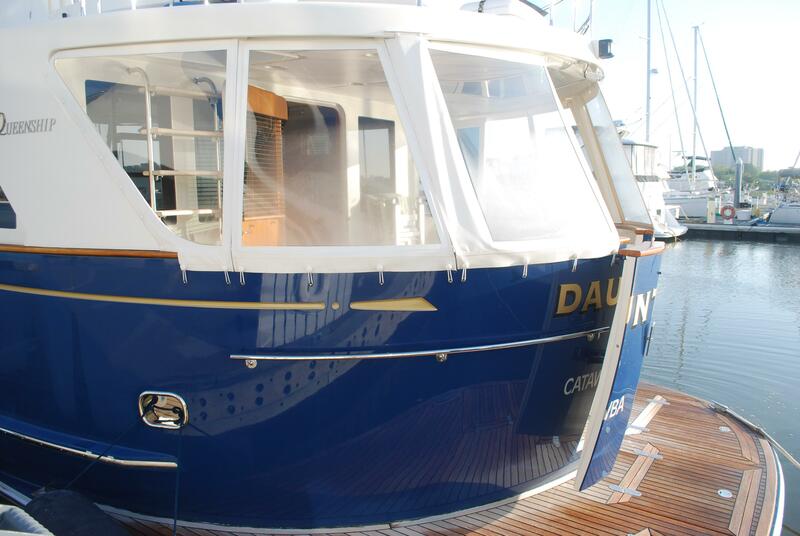 See full specs for complete list of equipment and features on "DAUNTLESS". 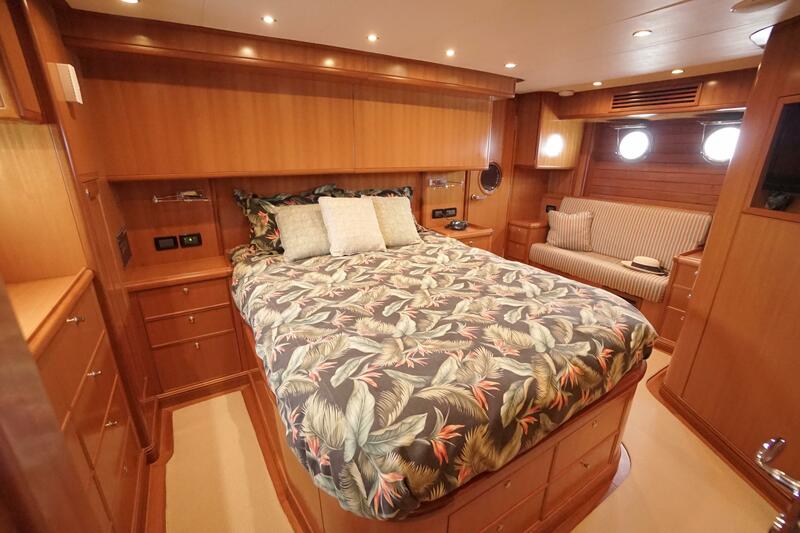 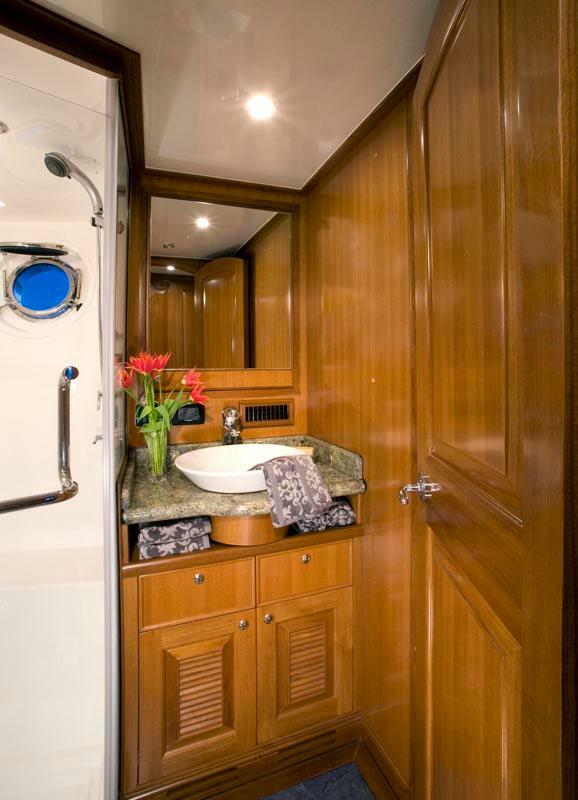 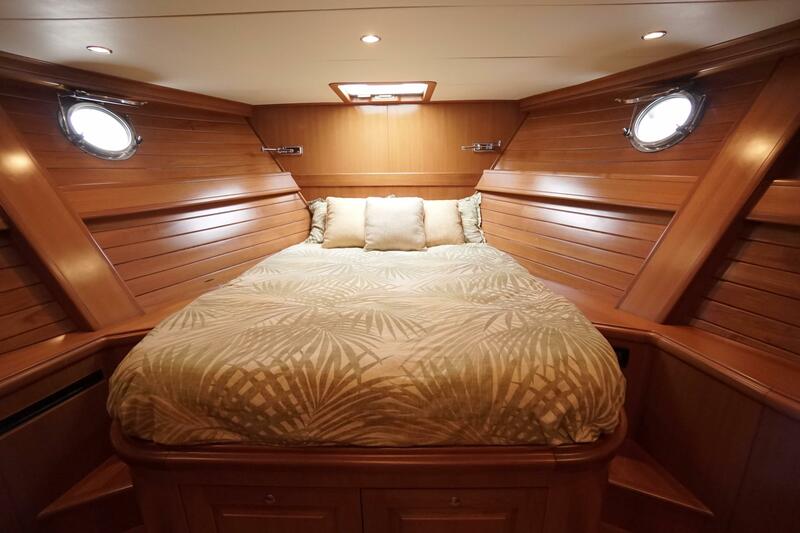 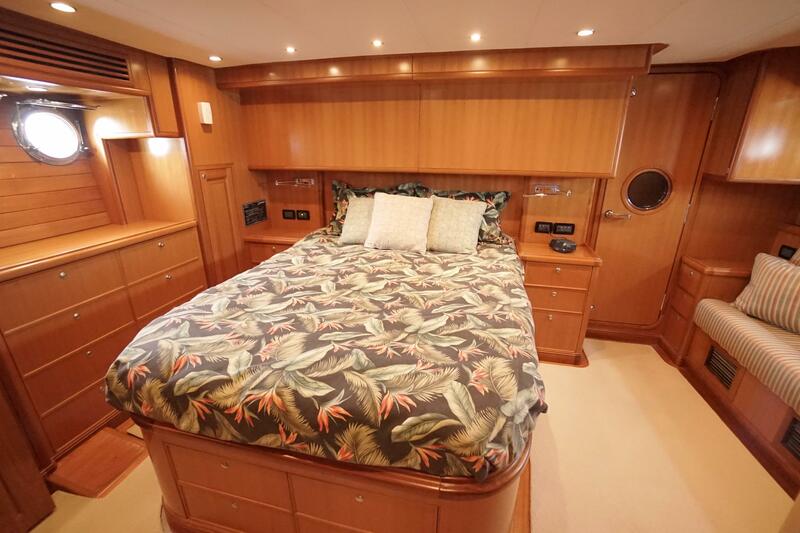 Luxurious comfort best describes the gorgeous Sparkman & Stephens's designed Queenship 60 Passagemaker. 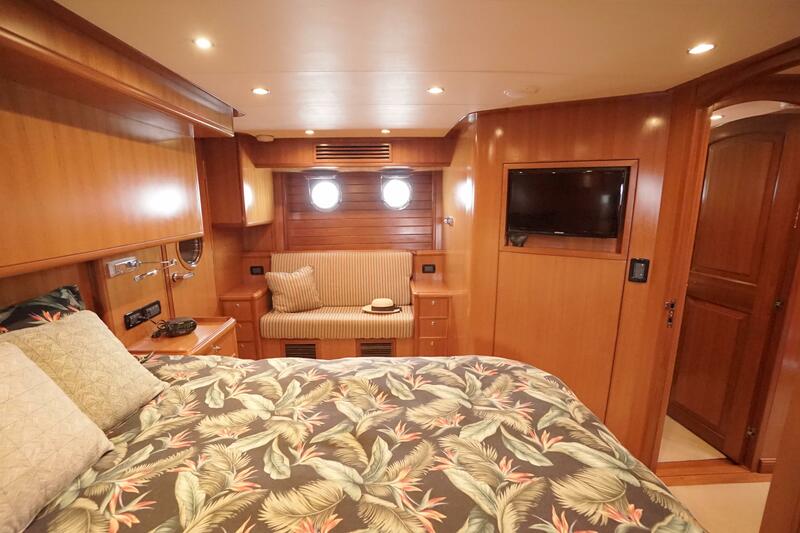 Spacious accommodations include a full beam master stateroom with an ensuite bathroom and two other sumptuous staterooms which will pamper the most discriminating guests. 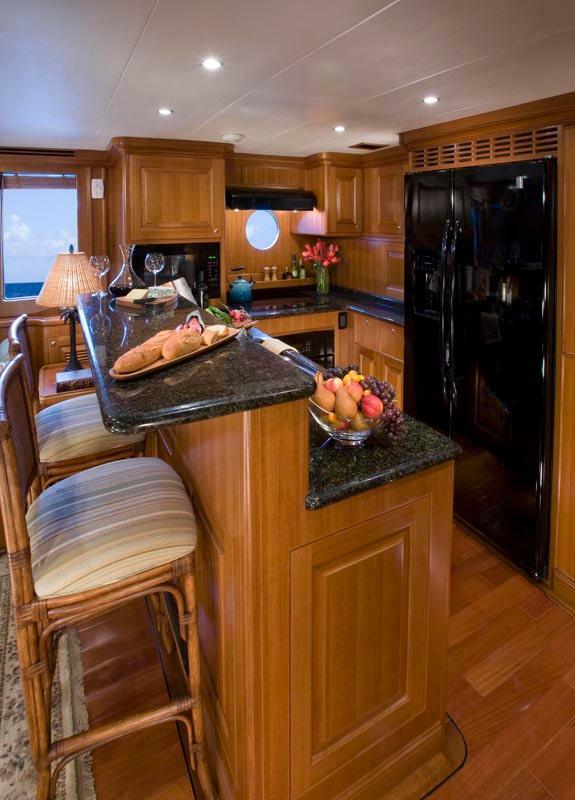 Elegant comfort abounds in the main salon with its rich wood finishing and granite countertops. 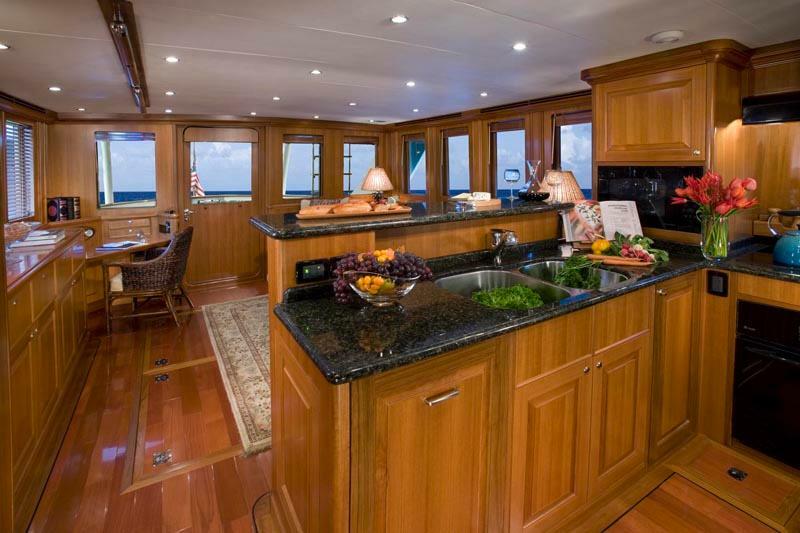 The spacious and functional galley includes all the amenities necessary to prepare the most exquisite meals. 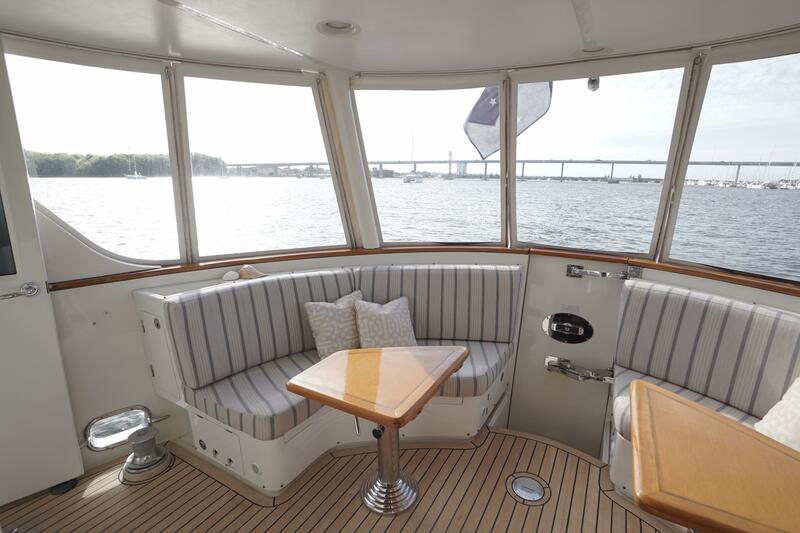 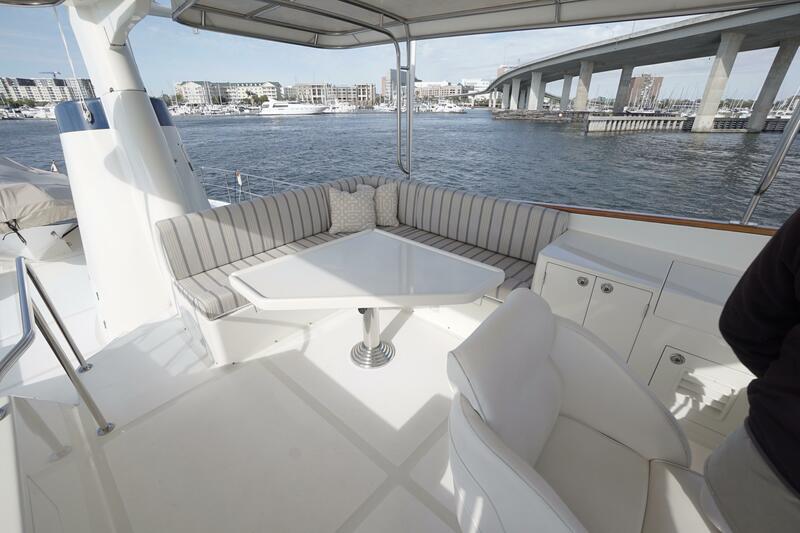 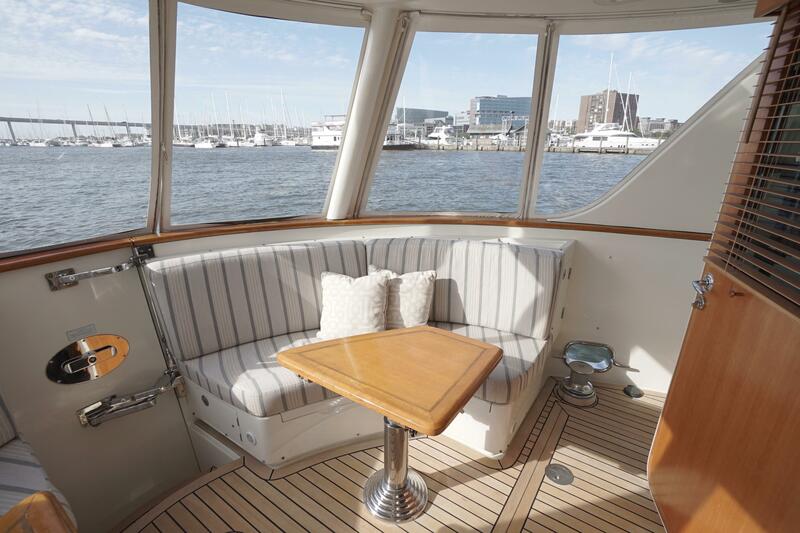 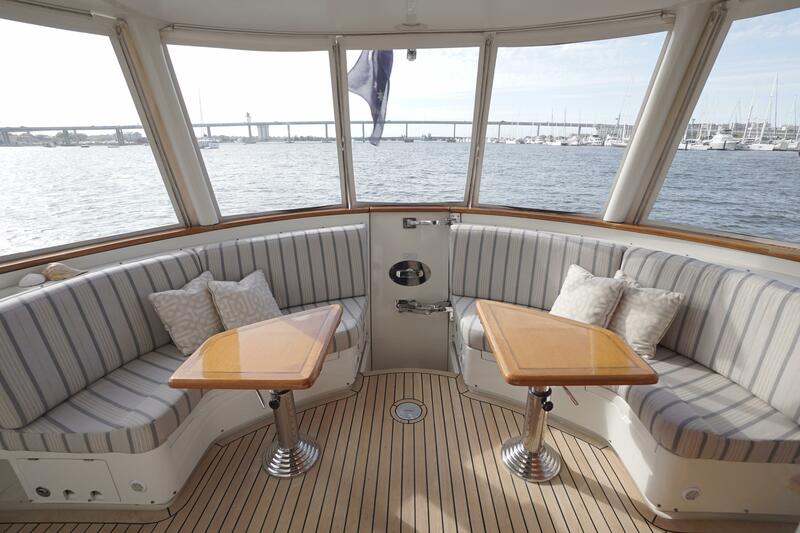 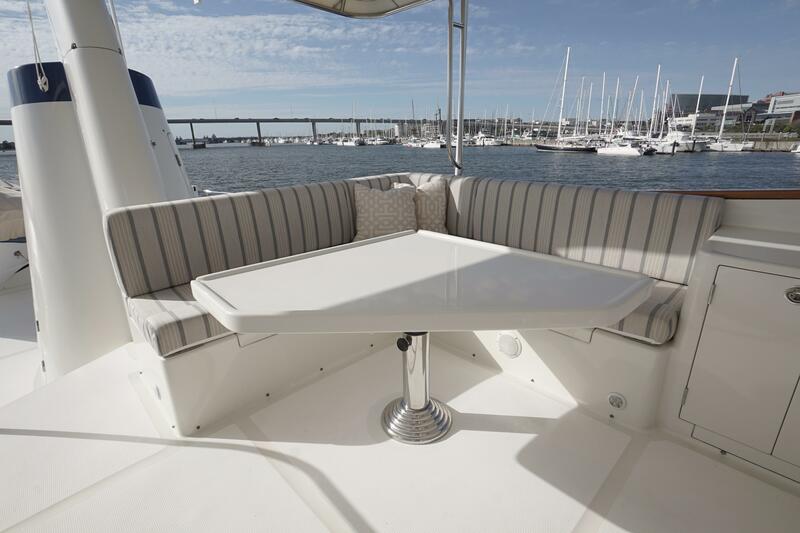 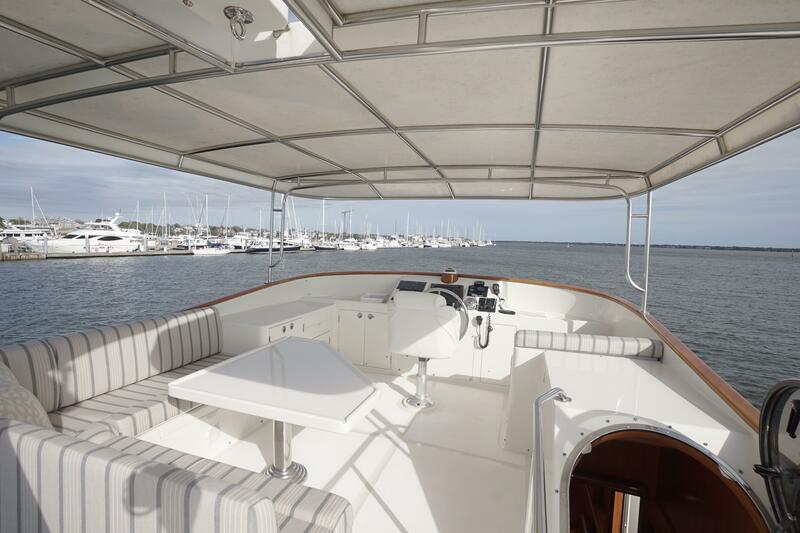 The pilothouse features a large settee that is ideal for entertaining. 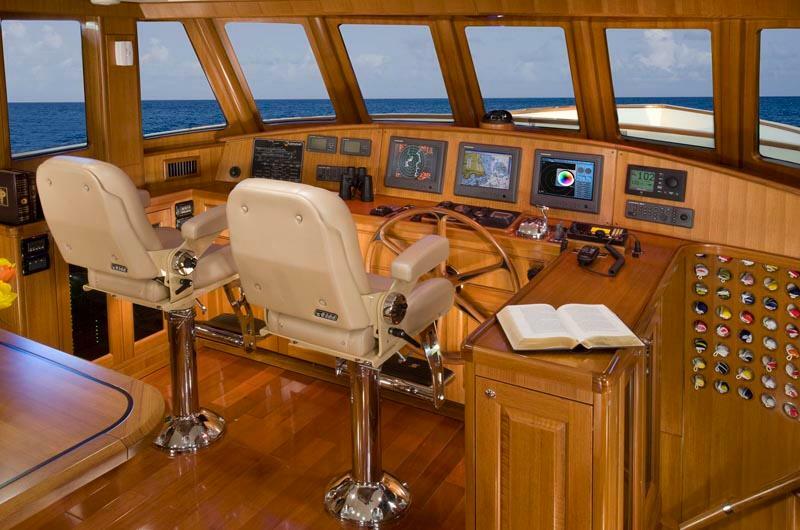 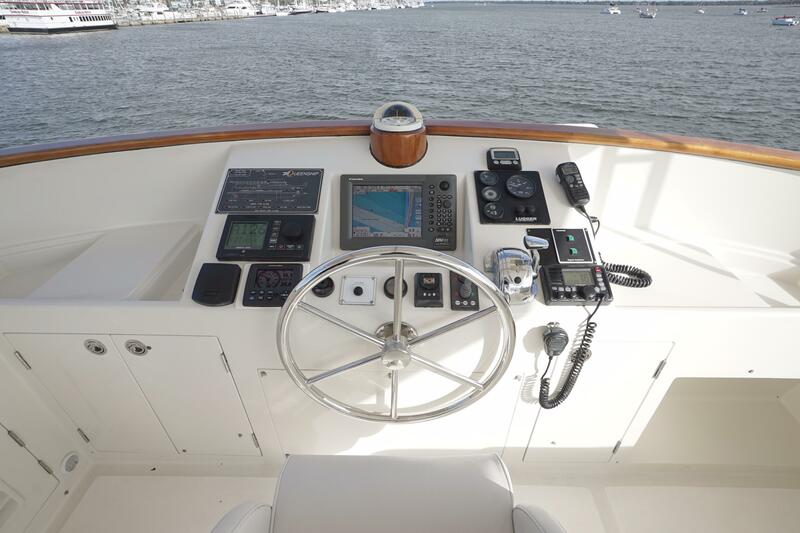 Views from the pilothouse are panoramic. 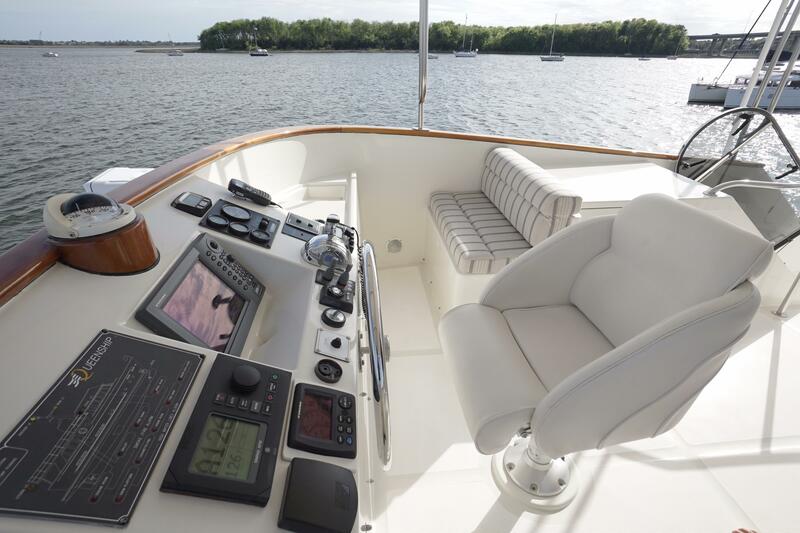 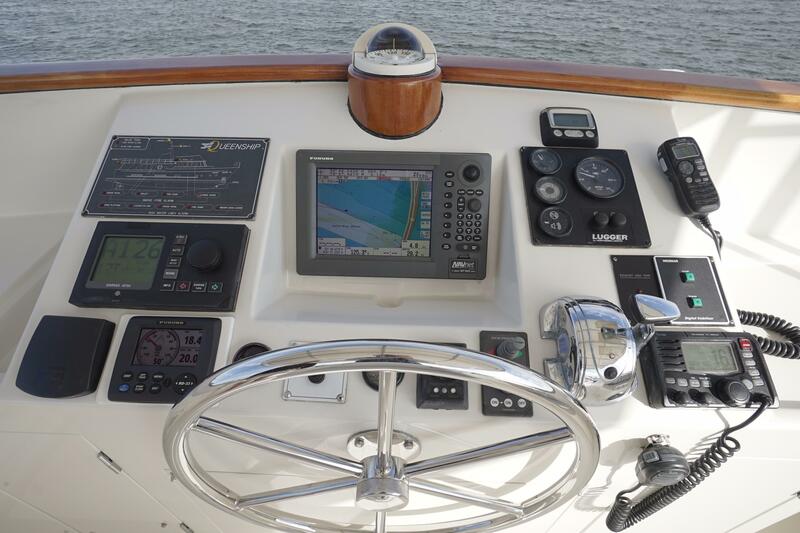 The Queenship 60 has been designed for ease of handling. 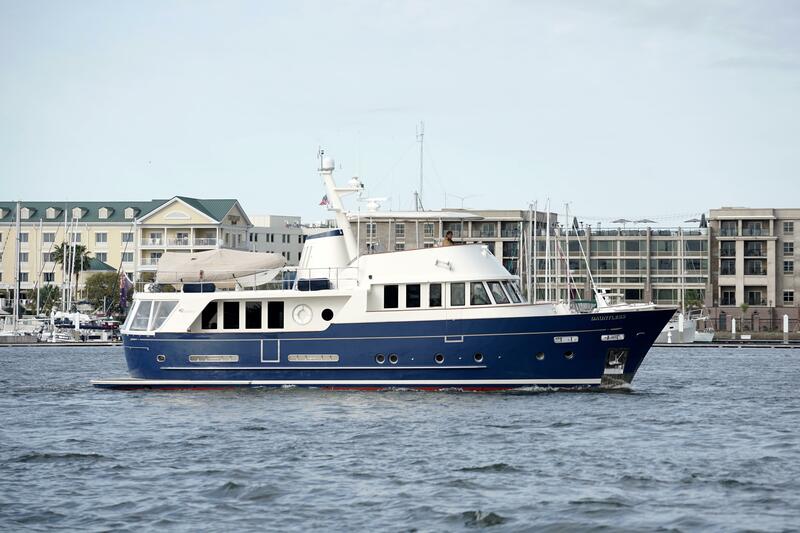 The very modest draft of 5 ft. will enable easy cruising of the Bahamas. 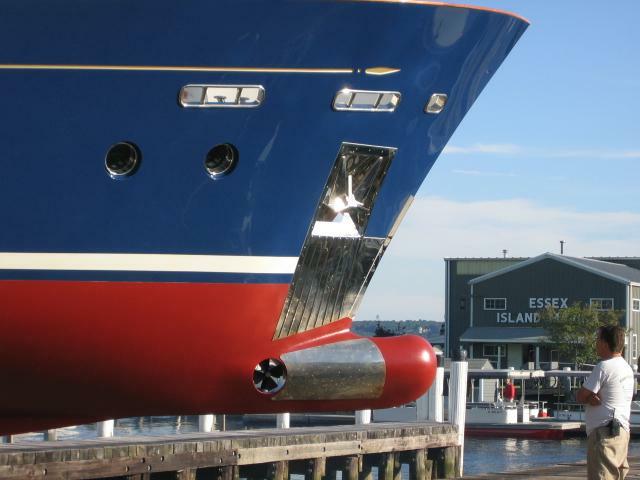 Her twin thrusters make docking a cinch. 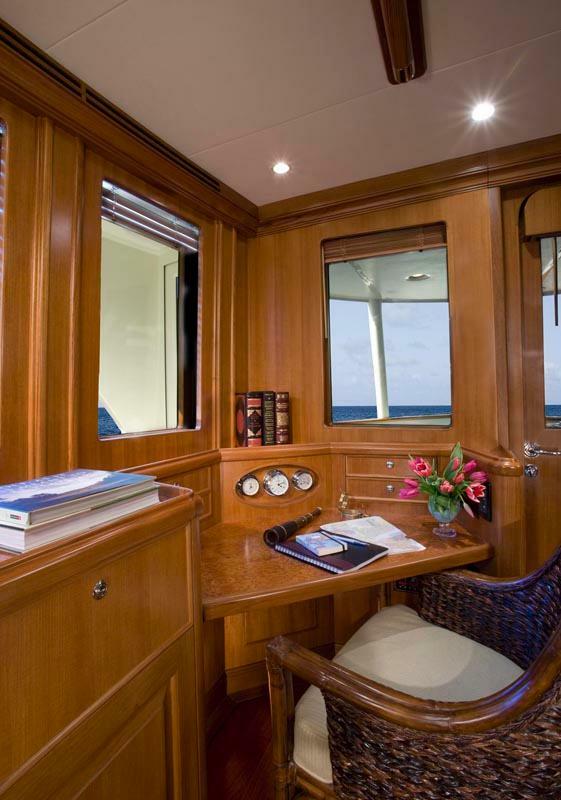 The Queenship 60 was designed with safety in mind and can safely cruise to the most distant ports. 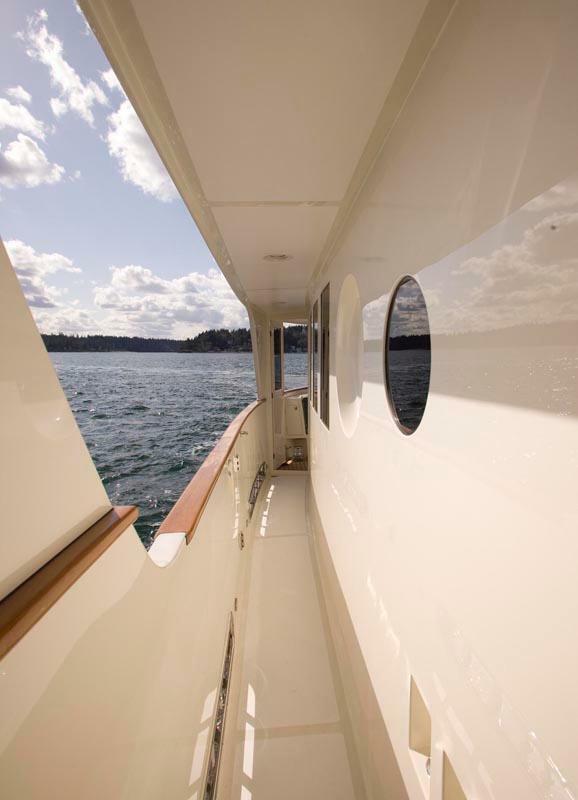 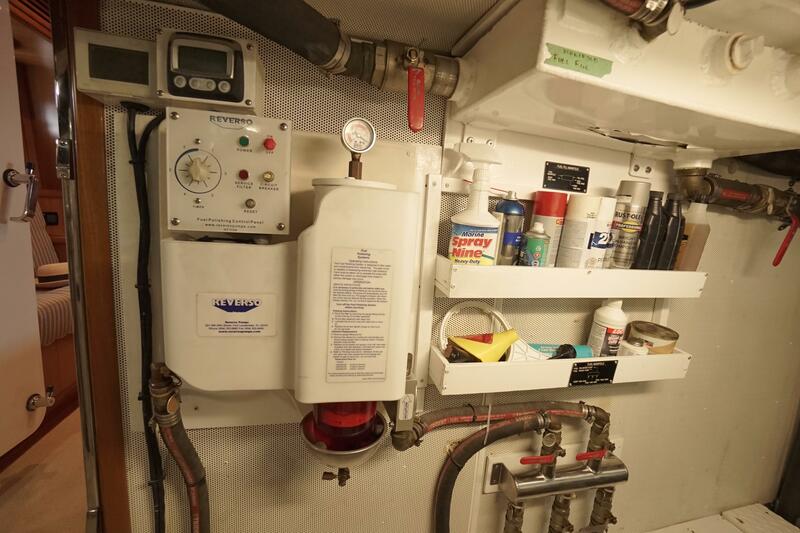 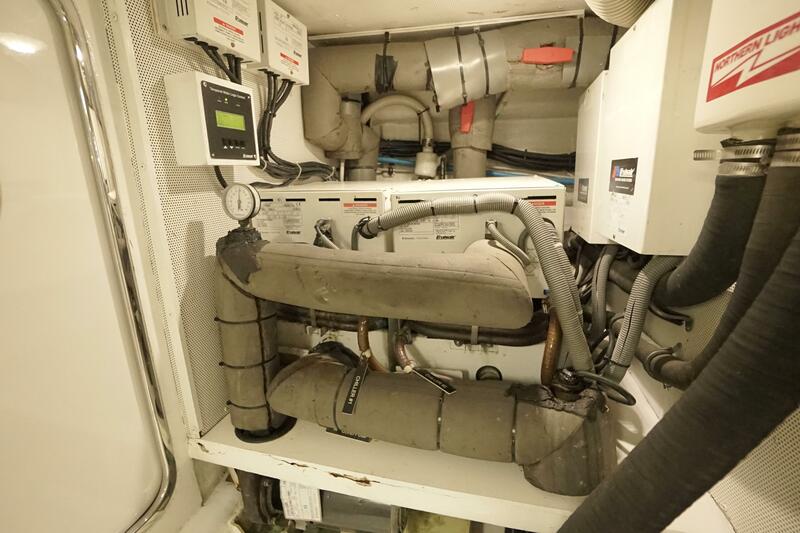 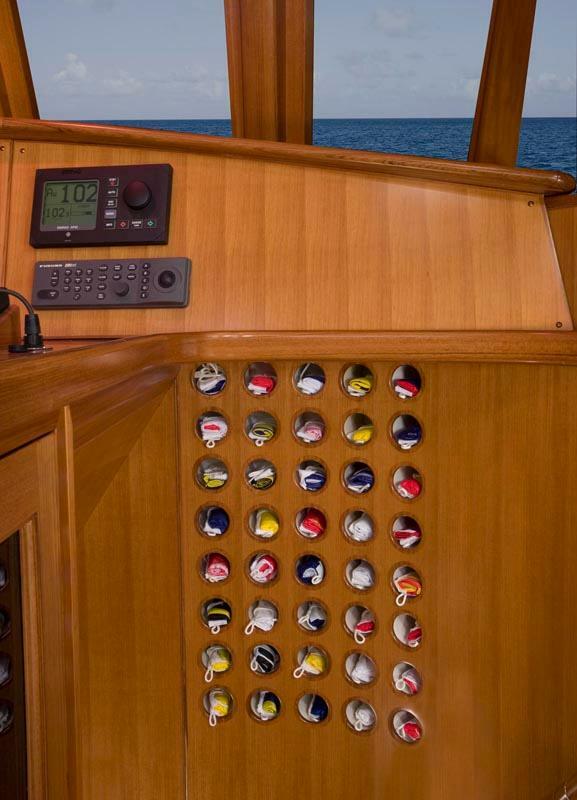 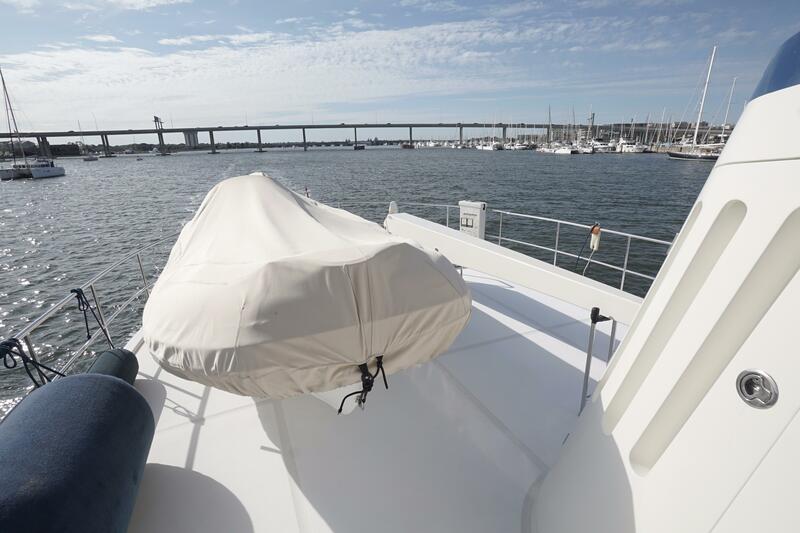 Watertight bulkheads ensure hull integrity and back-up emergency power is provided by the Get Home System. 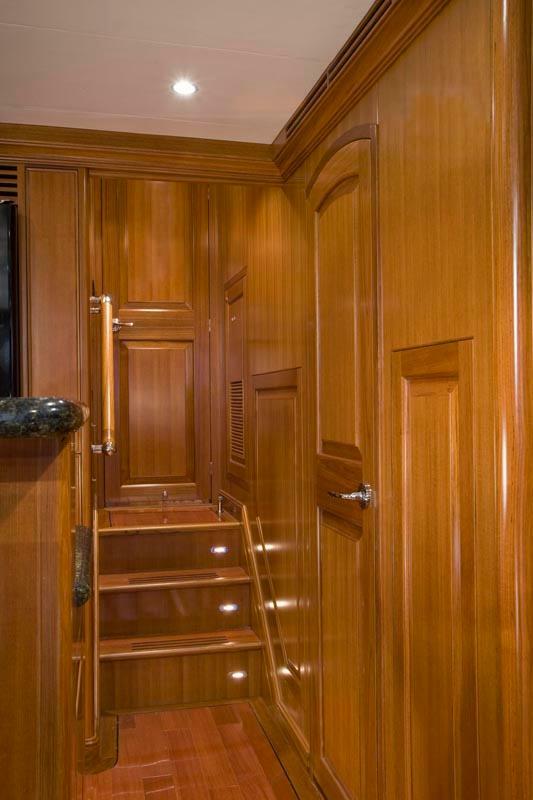 Enter into salon from aft deck. 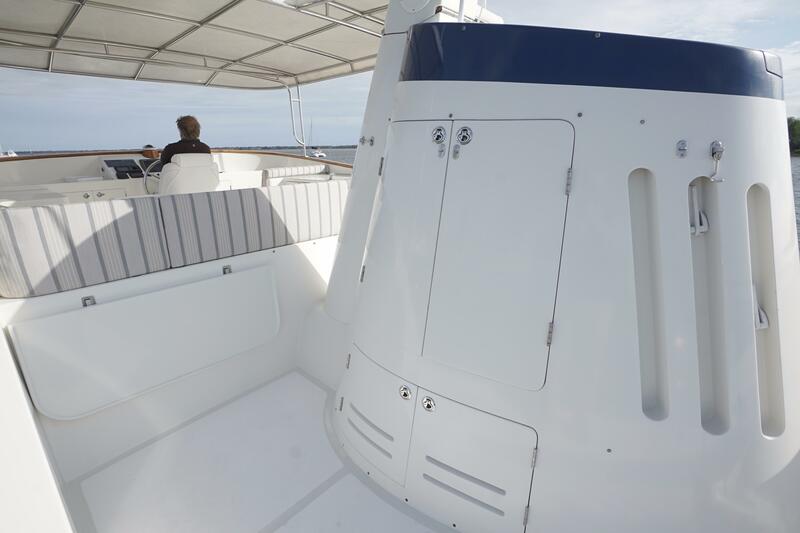 U-shaped galley on the port side forward and day head to the right. 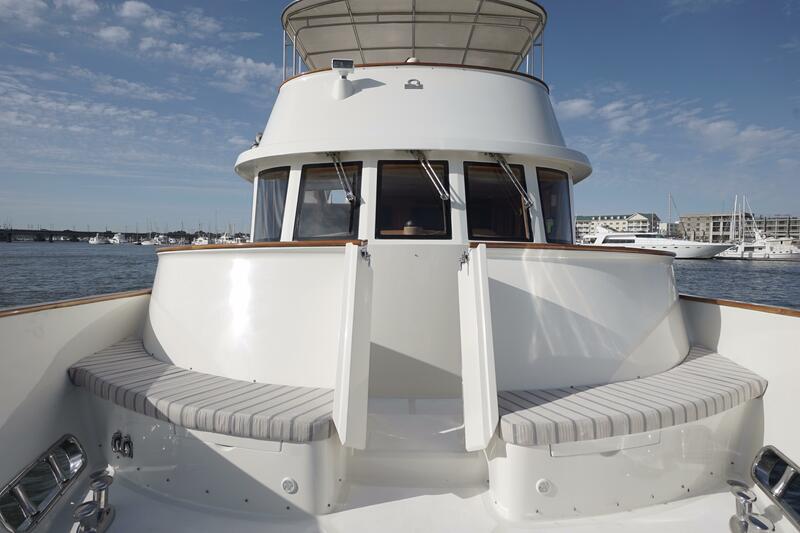 Up three stairs to Pilothouse. 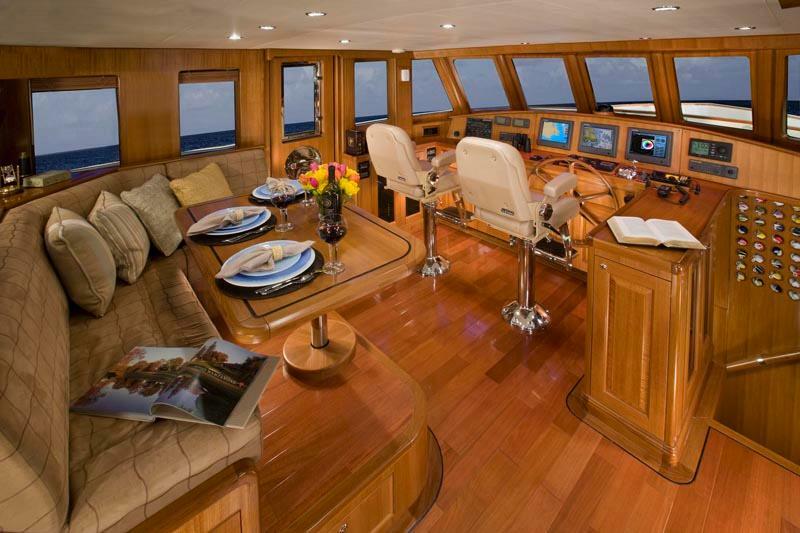 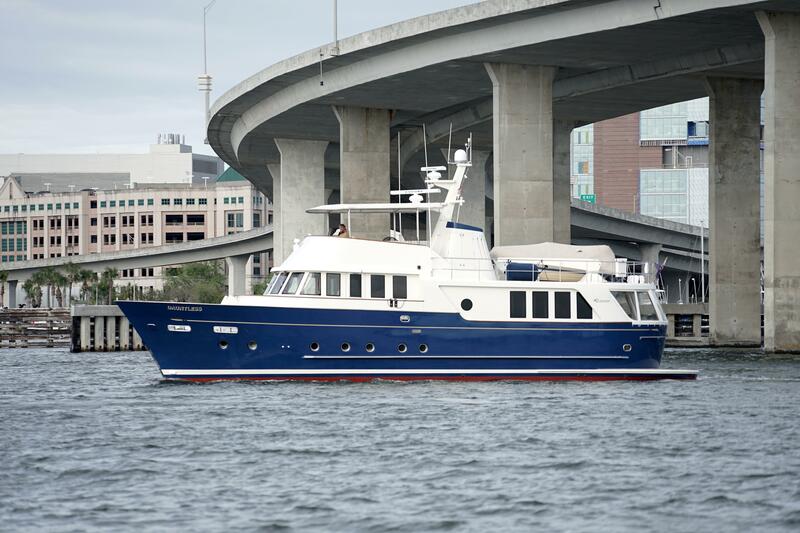 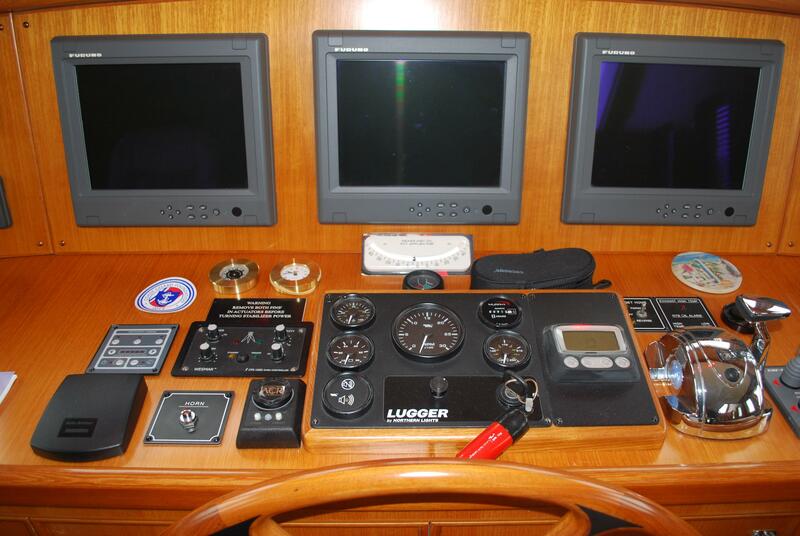 Lower deck and Flybridge accessed from Pilothouse. 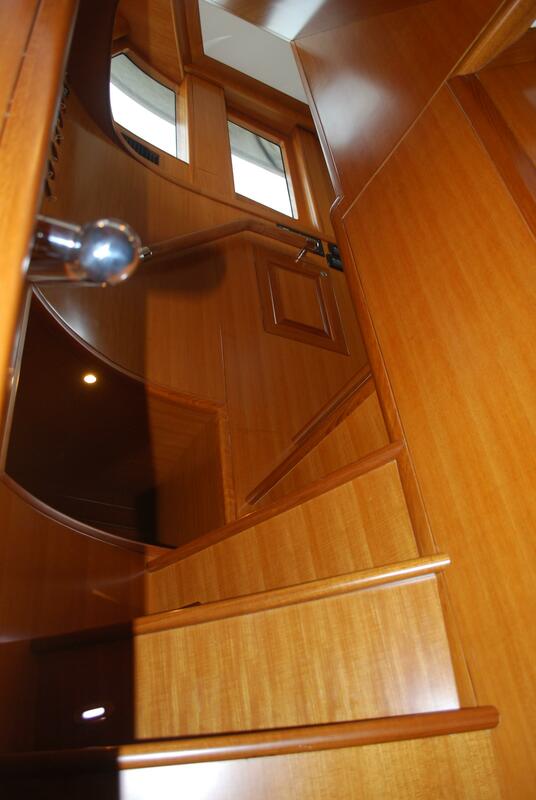 Down spiral staircase to starboard to lower deck and staterooms. 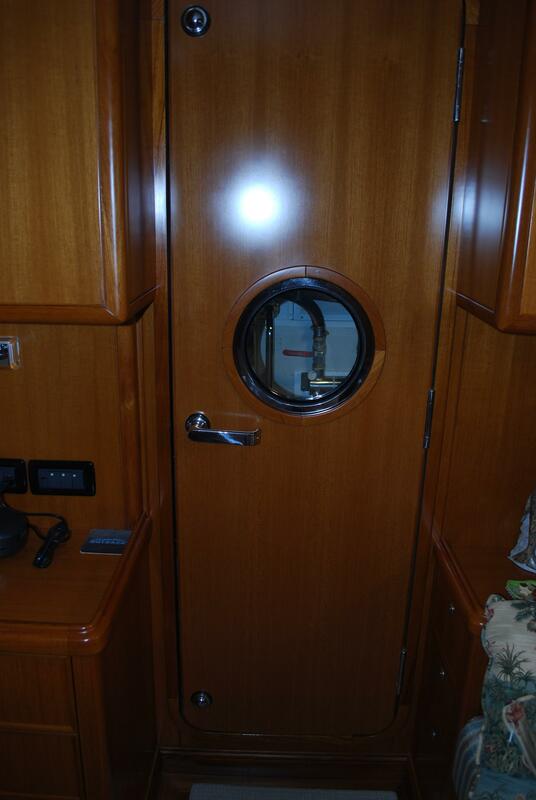 Forward lies the VIP Stateroom. 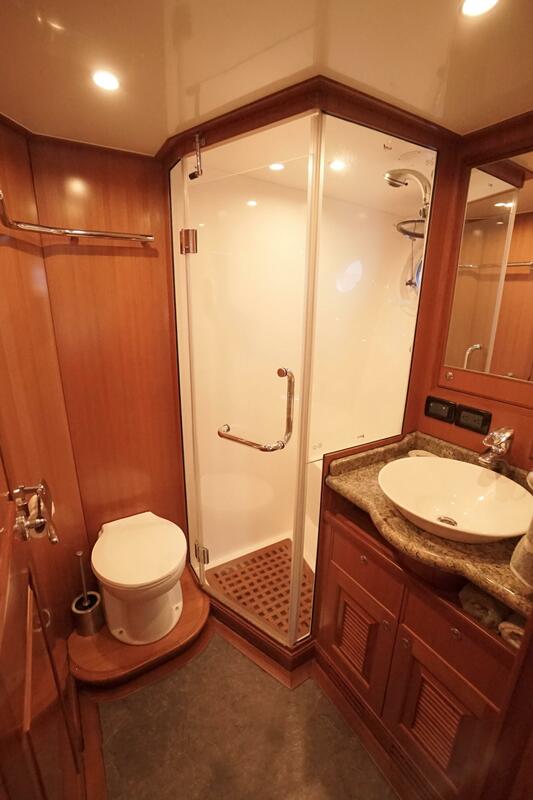 Guest stateroom located off hallway and shares a head and shower with the VIP. 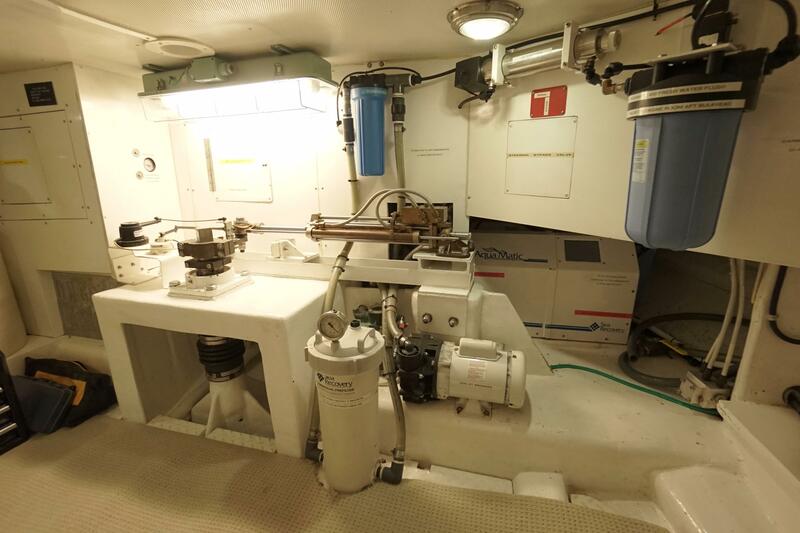 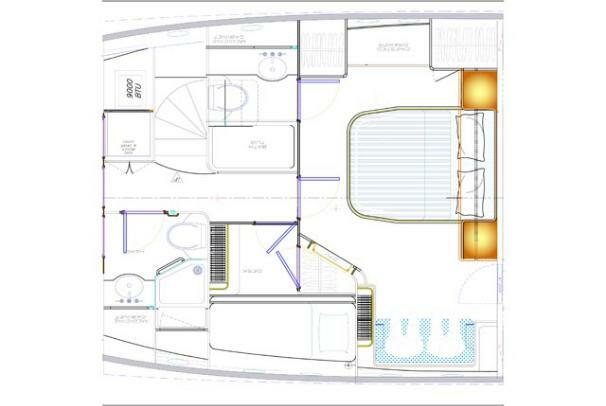 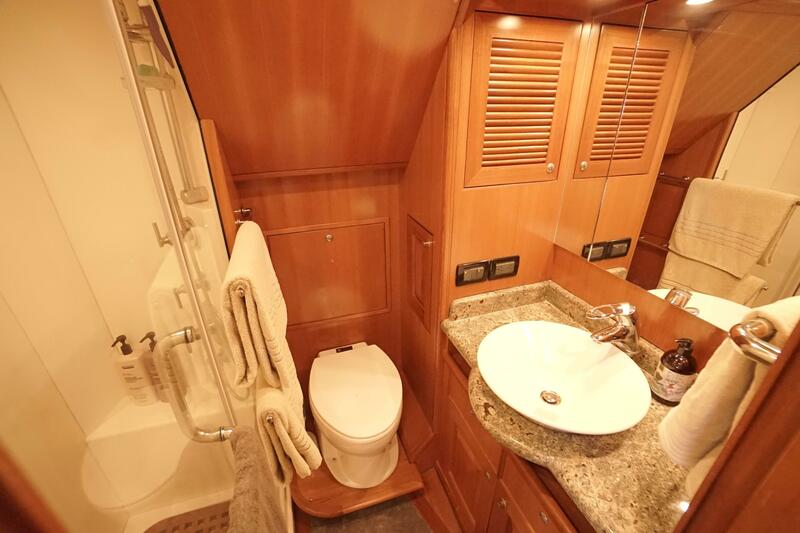 Full beam master stateroom lies aft and includes ensuite head and access to engine spaces. 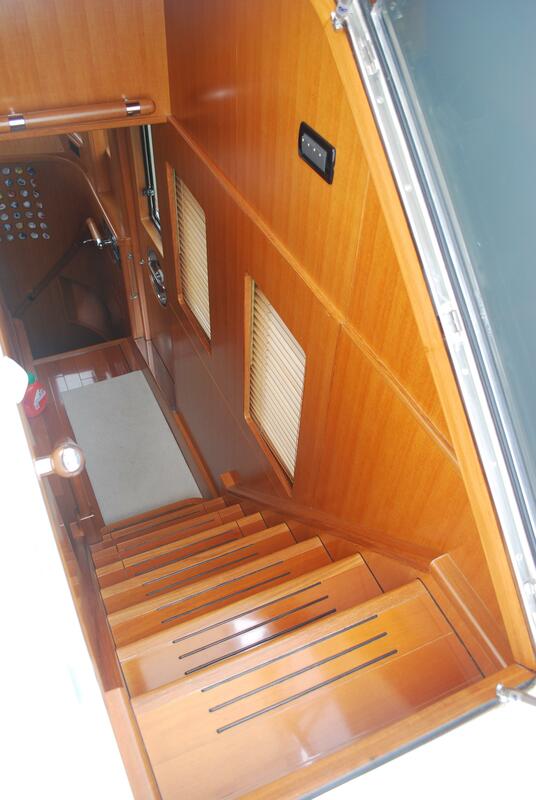 Stairs from starboard side of pilothouse lead up to expansive flybridge. 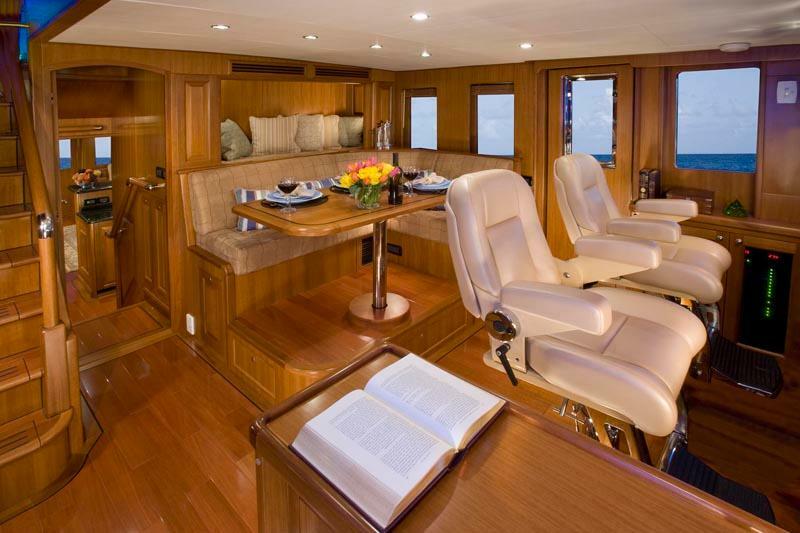 Enter salon from aft deck. 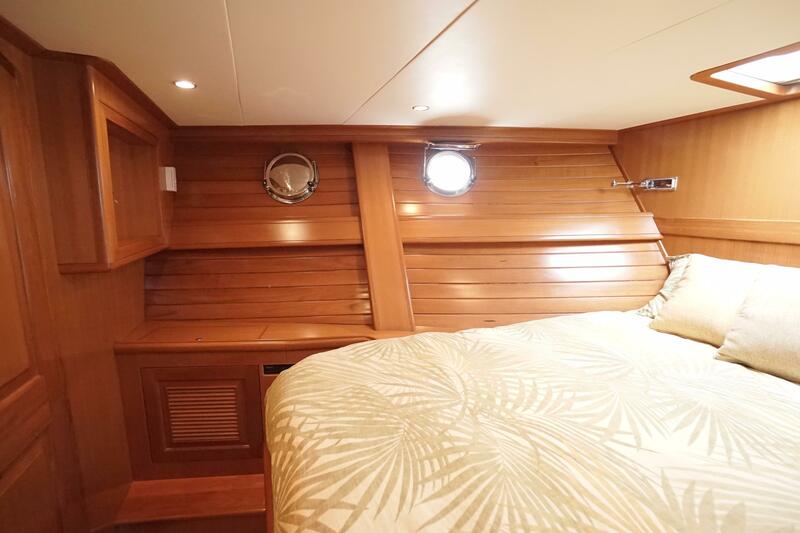 Desk is tucked into starboard corner and galley is forward on port side. 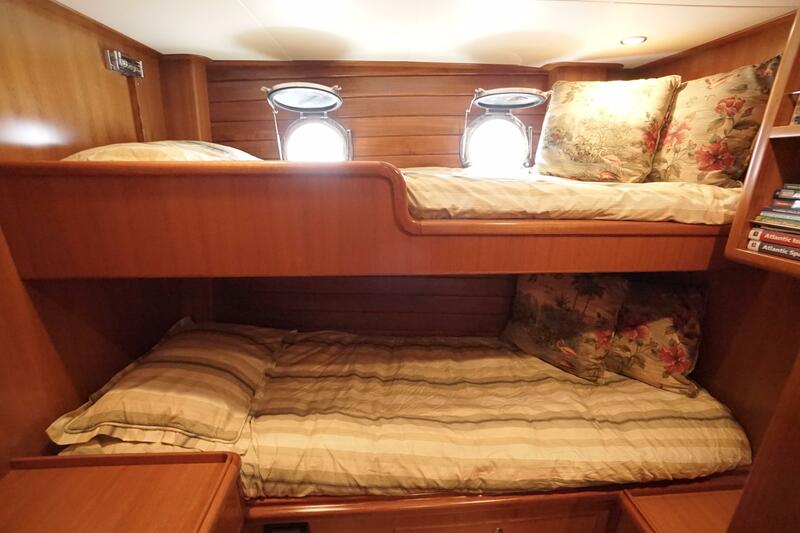 On the starboard side forward is day head. 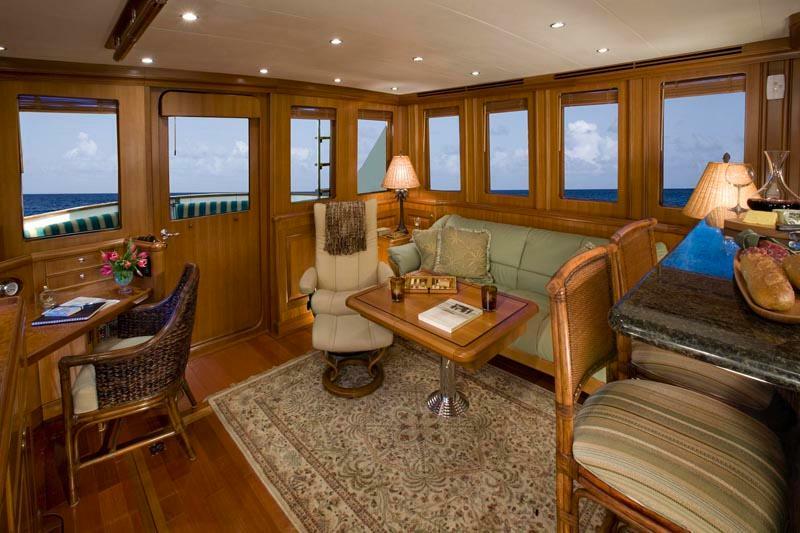 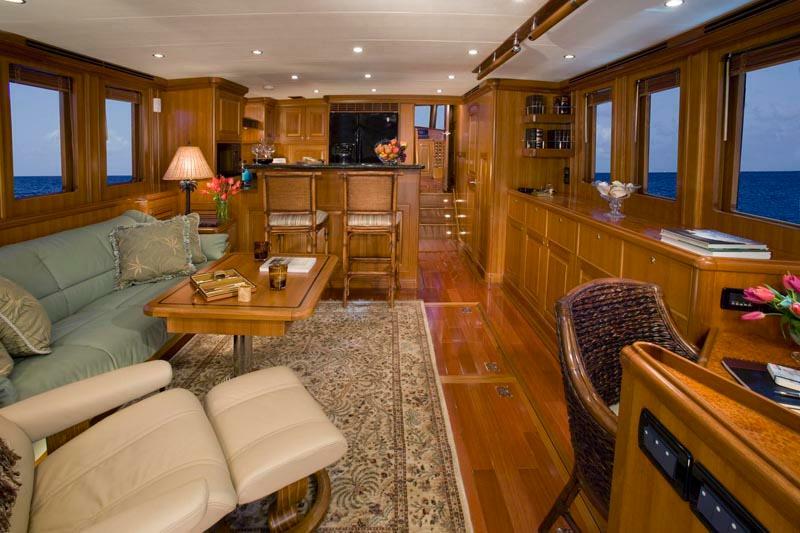 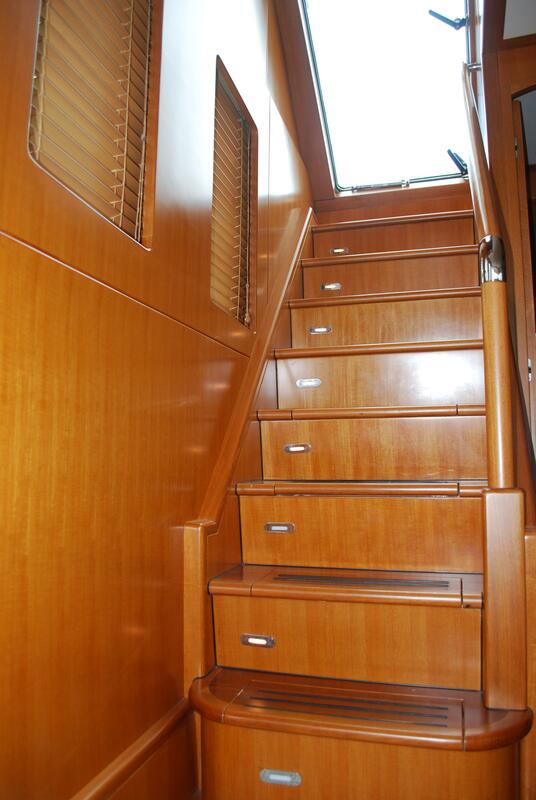 Forward up three steps is the pilothouse which is separated from Salon / Galley by a teak door. 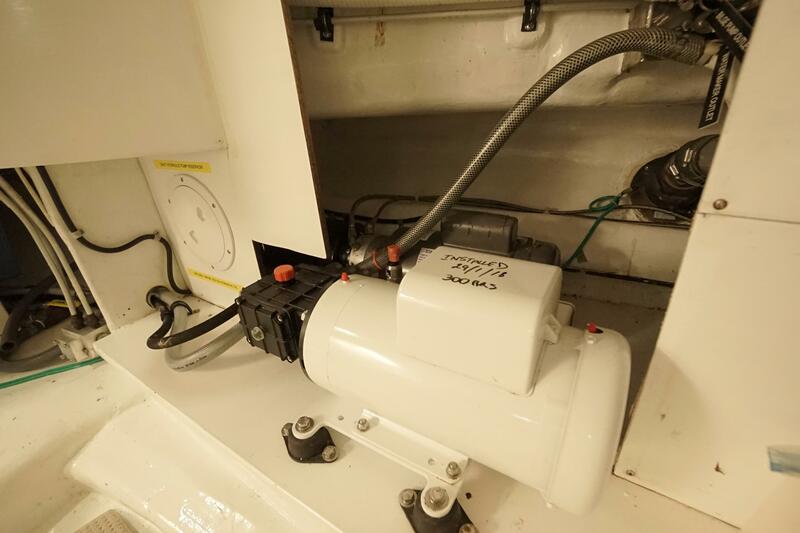 Emergency air supply damper shut-down system for main / generators & engine spaces. 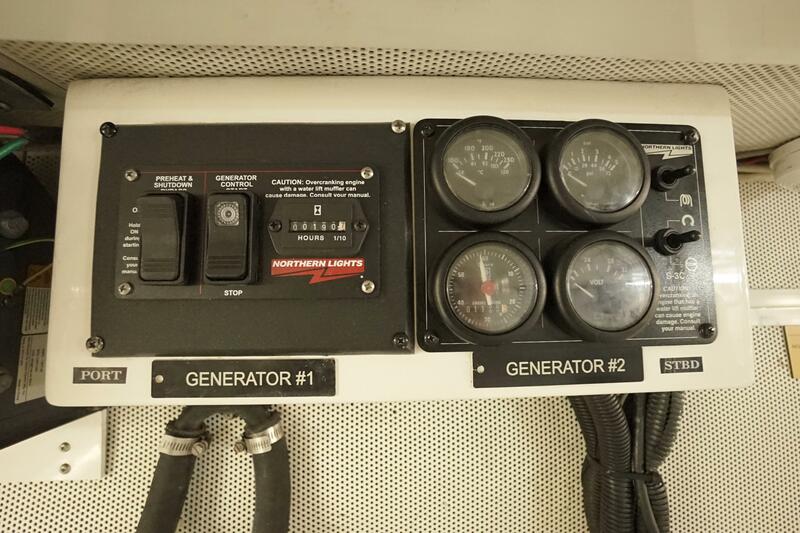 "Get Home" PTO System provides the capability to power the boat with either of the two Northern Lights 20KW Generators. 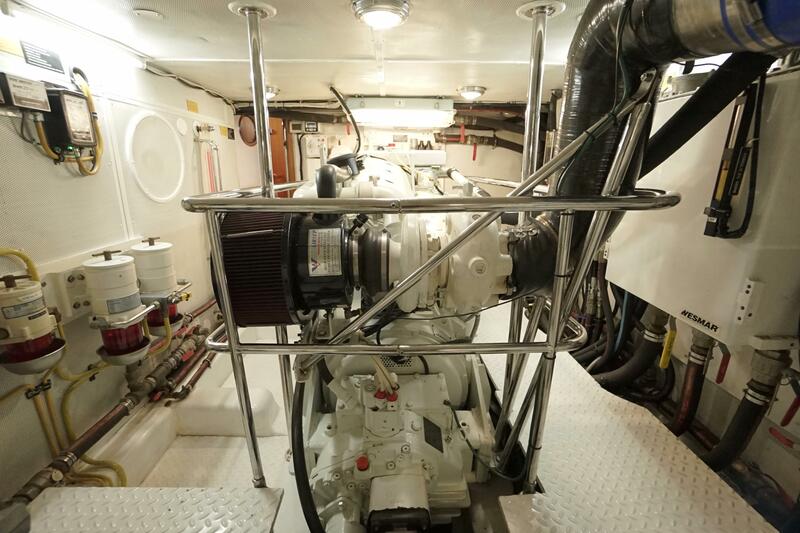 In the event of an engine failure, the generator hydraulically powers the main shaft to a speed of 4.5 knots. 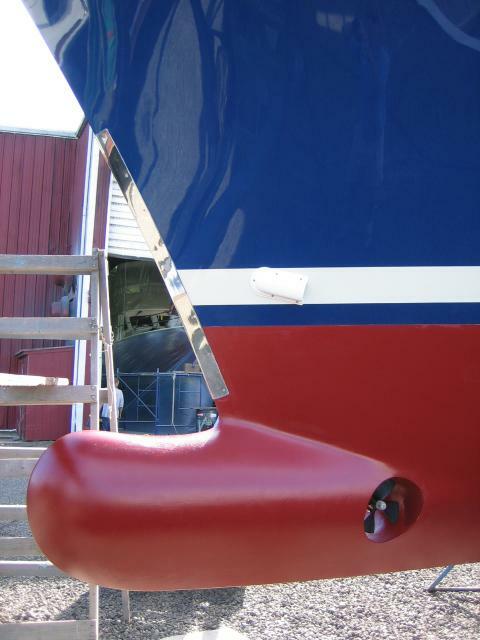 Dauntless' hull was built of fiberglass to ABS standards with a full length keel and keel shoe resulting in a hull with roll dampening properties that are not dependent upon stabilizers. 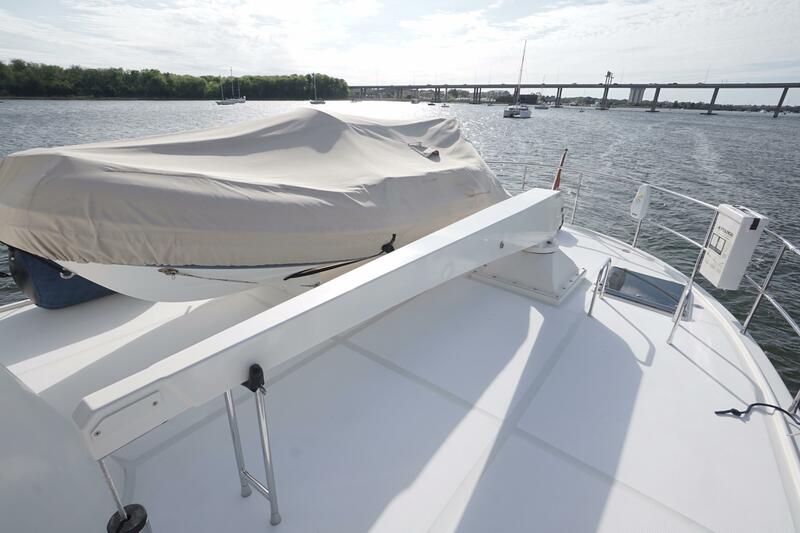 Integral swim platform eliminates "squatting"